The donated High Quality scans of the "Hasbro 1988 US Pre-Toy Fair Catalog"
"JEM and The Holograms - 'The Truly Outrageous Complete Series!'" Notice these version of Clash and "Splashes of Sound"
With golden-accented hair, glittery fashion and flashing Jemstar™ earrings. Includes fully posable, 12 1/2" doll, cassette tape, glitter fashion with pumps, Jerrica™ Fashion with sandals, 2 gold bracelets, gold sunglasses, hairpick, gold microphone, batteries and figure stand. Rio sports a glittery tux and gold sunglasses. 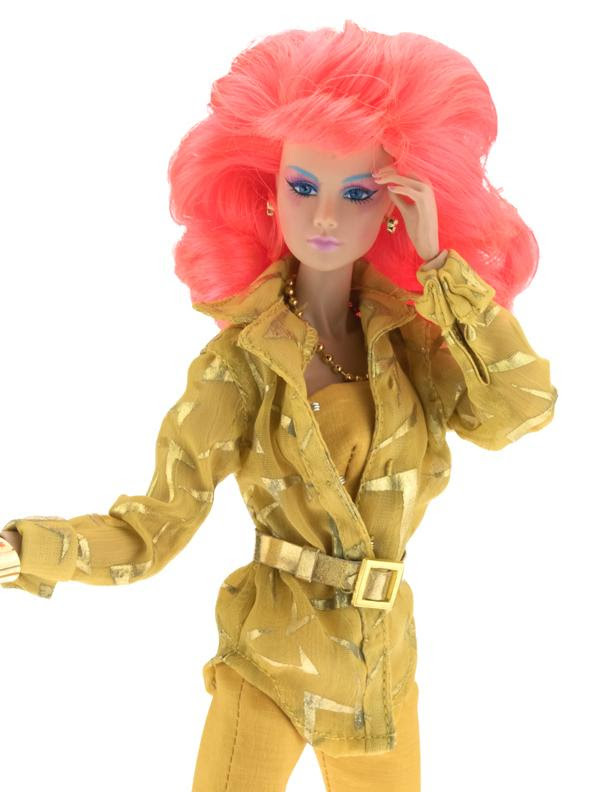 Includes fully posable, 12 1/2" doll, cassette tape, glitter outfit, sneakers, hairpick, gold sunglasses and figure stand, and a rose for JEM. 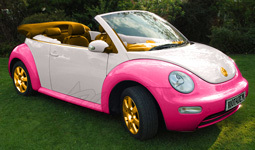 Glittery, golden Roadster especially for Glitter'n Gold JEM. Built-in, battery-operated FM radio in the trunk. Store fashions and accessories under the hood. Includes jack for easy hook up to the Rock Backstager™ extension speaker. JEM's newest fashion hairstyle -- long, curly and combable. 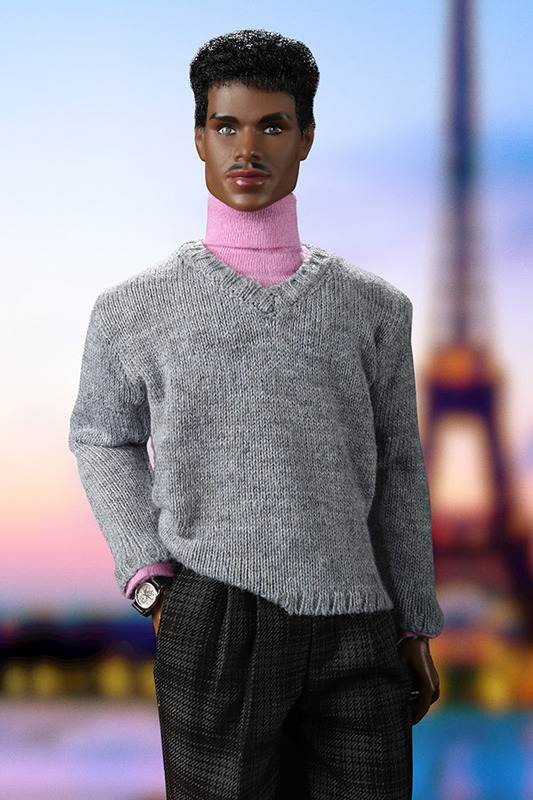 Includes fully poseable, 12 1/2" doll, stage fashion, earrings, 2 bracelets, pumps, hairpick, 2 hair ties and microphone. 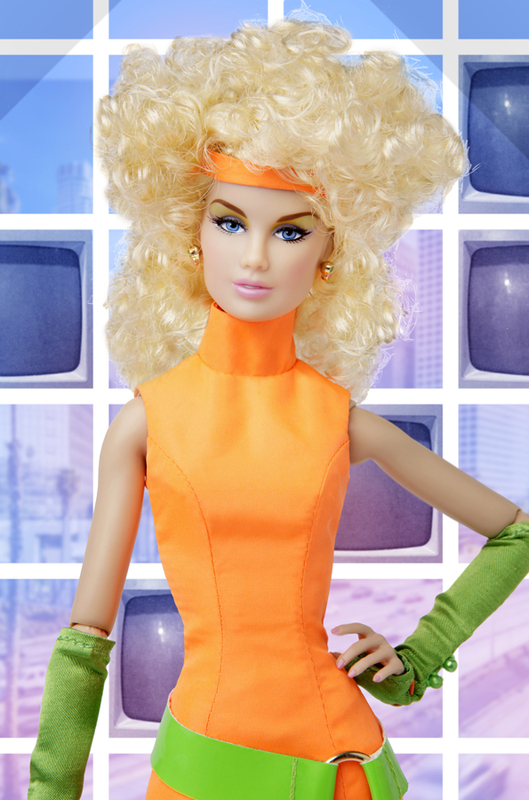 She has the power to transform Jerrica™ into JEM through her super holographic computer. Unique look and glittery hair. 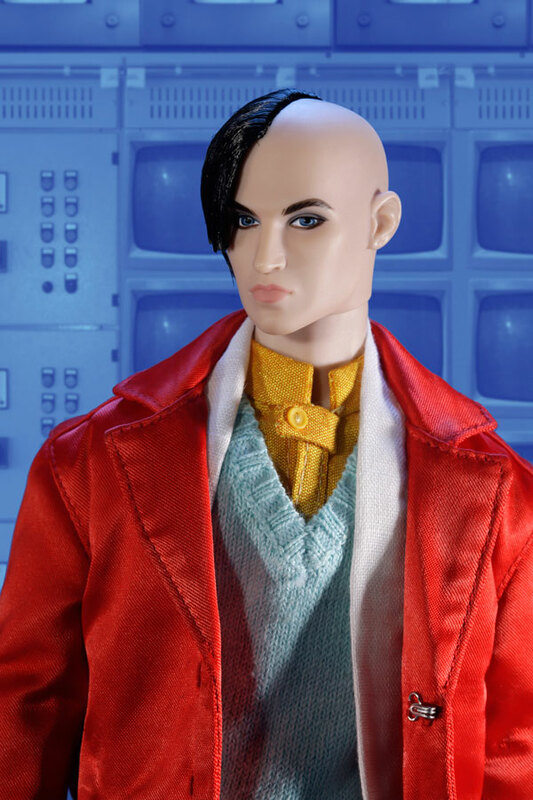 Includes fully poseable, 12 1/2" doll fashion, pretend computer, hairpick, boots, cassette, and figure stand. 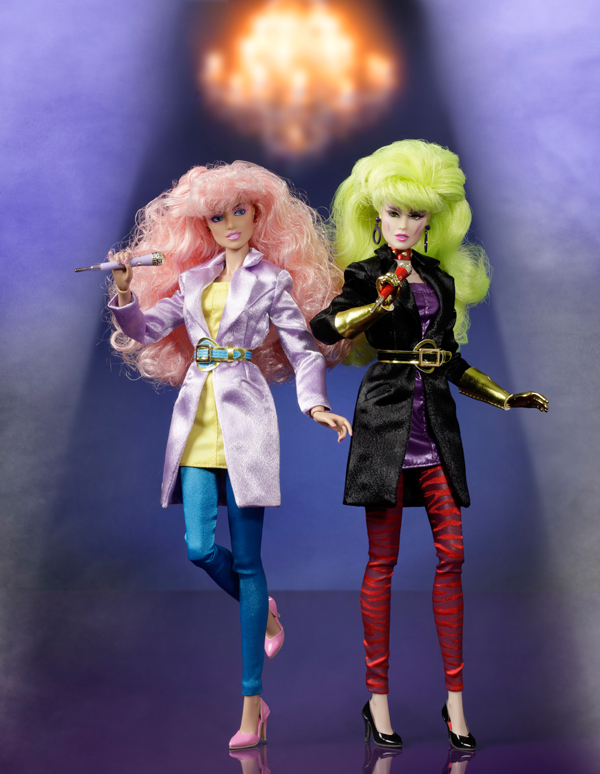 JEM doll with cassette tape features the JEM theme and two new songs from JEM and the Holograms. Flashing Jemstar™ earrings operate on two 1 1/2 volt button cell batteries (included). 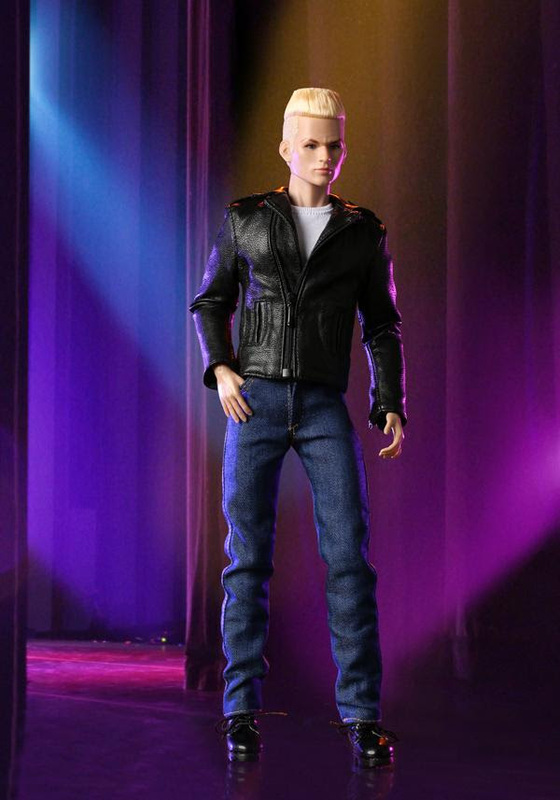 Includes fully posable, 12 1/2" doll with stage fashion, Jerrica™ fashion, cassette tape, hosiery, 1 pair of pumps, 1 pair of boots, hairpick, microphone, sunglasses, bracelet, batteries and figures stand. JEM's ON STAGE FASHIONS™ ASST. Ten high fashion outfits designed especially for JEM and the Holograms™. JEM/JERRICA™ FLIP SIDE FASHIONS™ ASST. 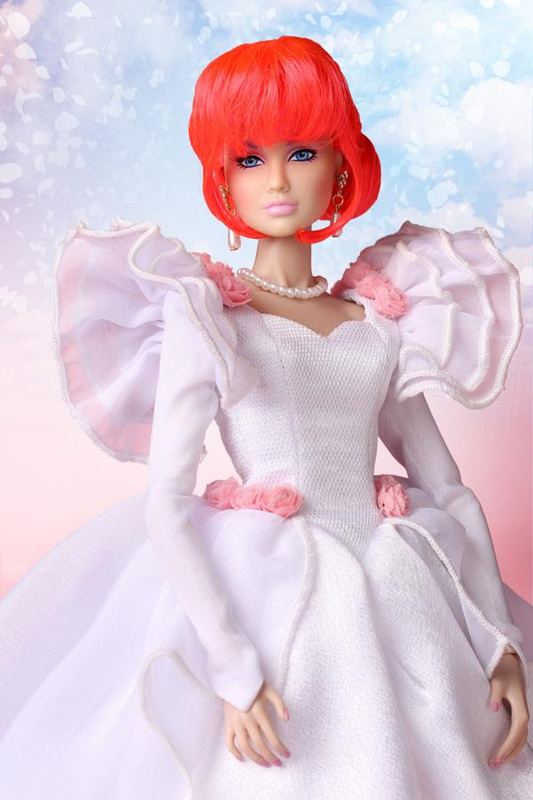 Ten high fashion outfits designed especially for JEM/Jerrica. 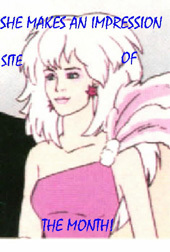 Each fashion converts from Jerrrica's executive style to JEM's outrageous stage look. Eight unique stage fashions designed especially for the Misfits. JEM's MUSIC IS MAGIC FASHIONS™ ASST. 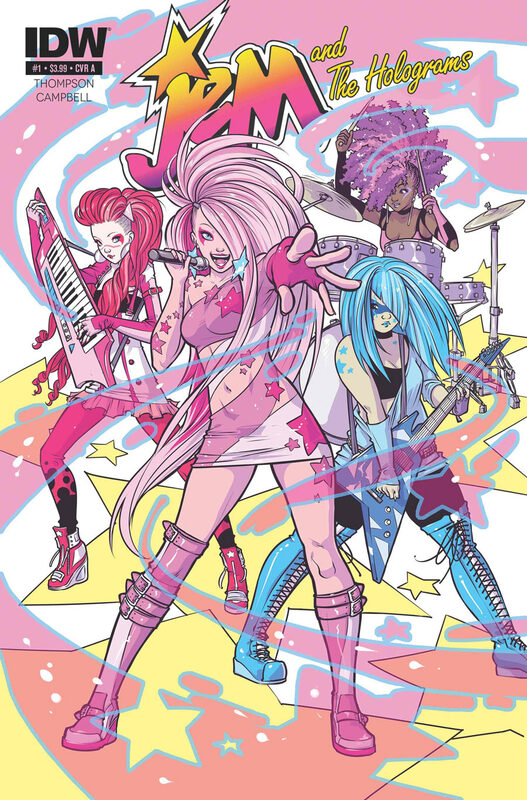 Six fabulous stage outfits for JEM and the Holograms™. Each includes a musical instrument designed to complement a unique stage fashion. JEM's GLITTER 'N GOLD FASHIONS™ ASST. Glittery, gold and exquisitely-fashioned outfits specially designed for Glitter 'n Gold JEM. JEM themed, 3-function digital wrist watches. Adjustable strap fits child's wrist. Press release key to display time. 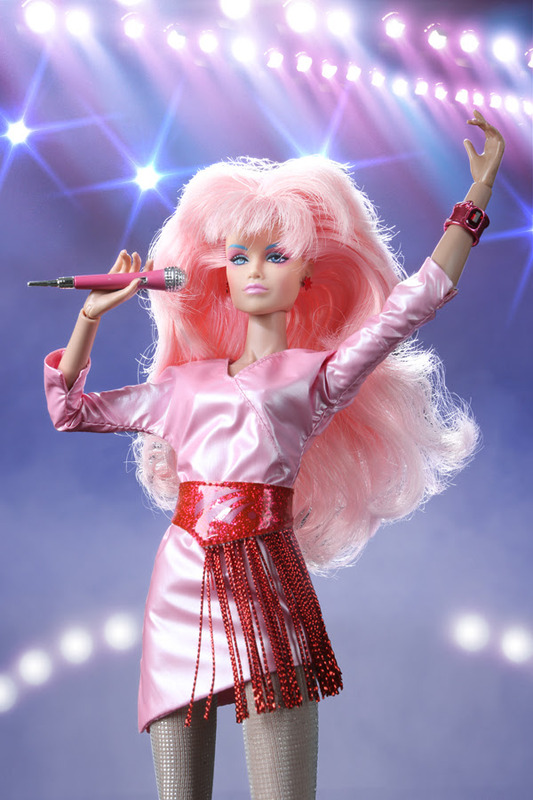 Video produces award-winning rock videos for JEM and the Holograms. 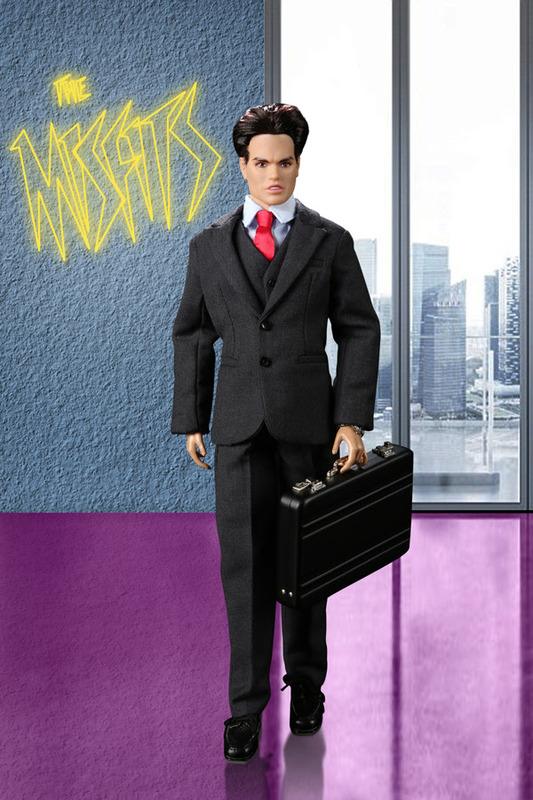 Includes fully poseable, 12 1/2" doll, cassette tape, stage fashion, pretend video camera, pumps, hairpick and figure stand. The Misfits' newest rocker has multicolored hair and unique face makeup. Clash jams holographic signals with her distortion modulator. 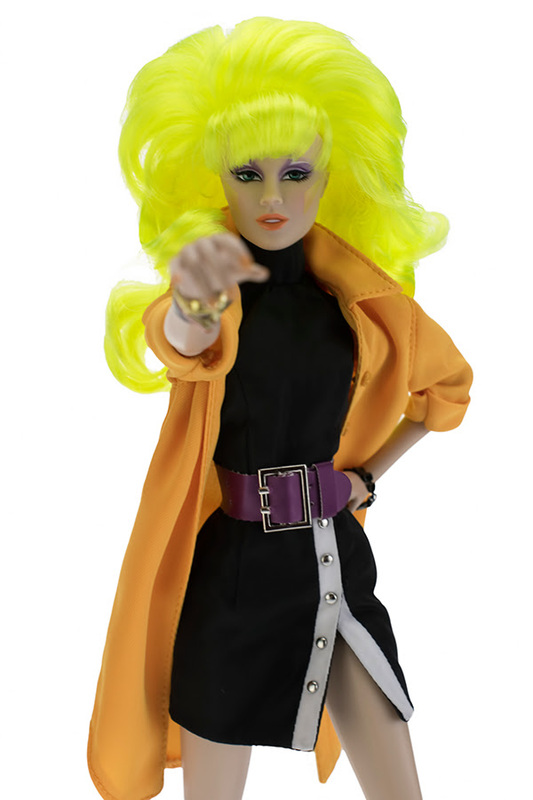 Includes fully poseable, 12 1/2" doll, stage fashion, cassette tape, "distortion modulator," 2 bracelets, pumps, hairpick and figure stand. More poseable then ever! Her legs and arms bend in two ways so she can cross her legs or hold her microphone like a real rock ‘n roll star! 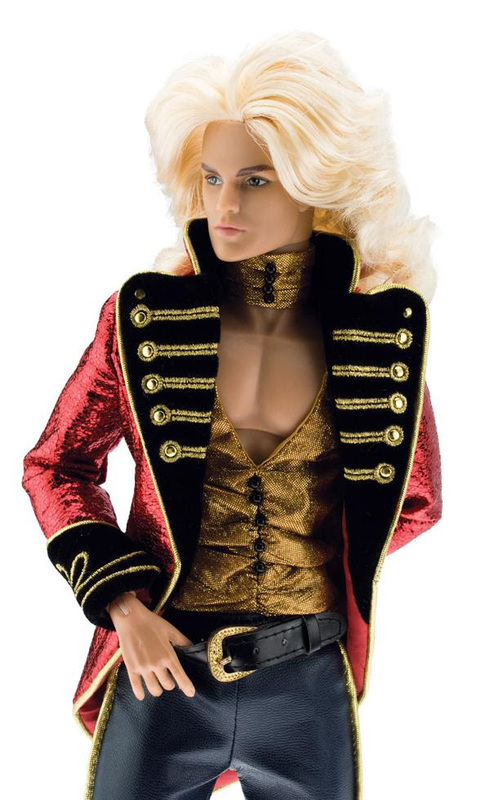 12 1/2", fully articulated fashion doll has long pink, blonde and gold rooted hair! 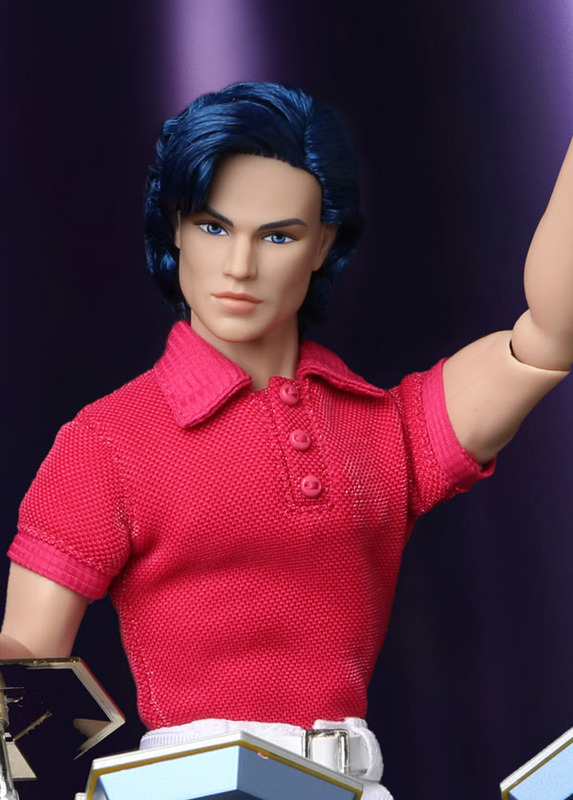 12 1/2", fully articulated male fashion doll has purple and black hair! 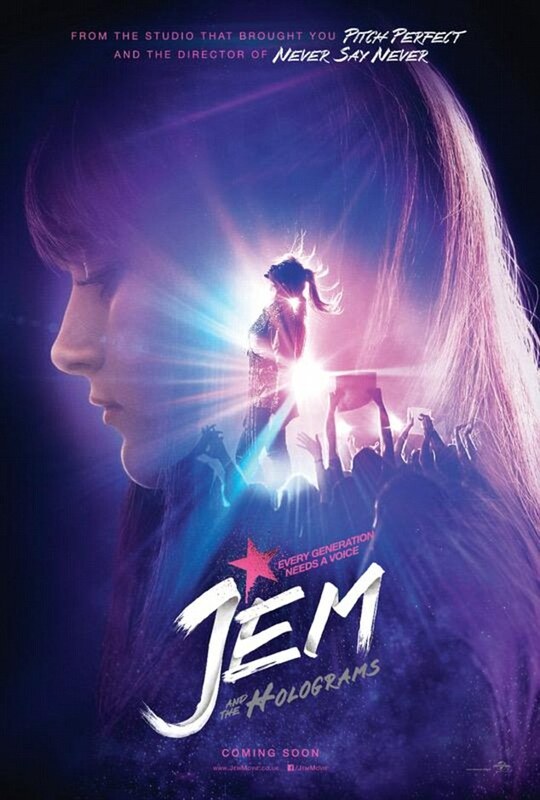 JEM® revs up for a night of glamour, glitter, fashion, and fame while her fans listen to their favorite music on JEM’s FM radio! Lift the trunk to reveal a built-in FM radio and speaker! 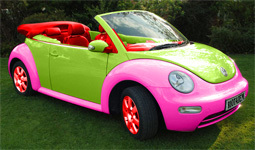 Raise the roof so JEM can cruise in her glittery Roadster with its flashy interior! There’s plenty of room under the hoof for JEM’s fashions and accessories! Includes jack for easy hook up to the Rock Backstager™ extension speaker! Six, glittery, gold and exquisitely-fashioned outfits specially designed for Glitter ‘ Gold JEM!® Designed in rich, glittering fabrics, each outfit is multipiece with matching shoes, accessories and includes a JEM Rock Star Poster! 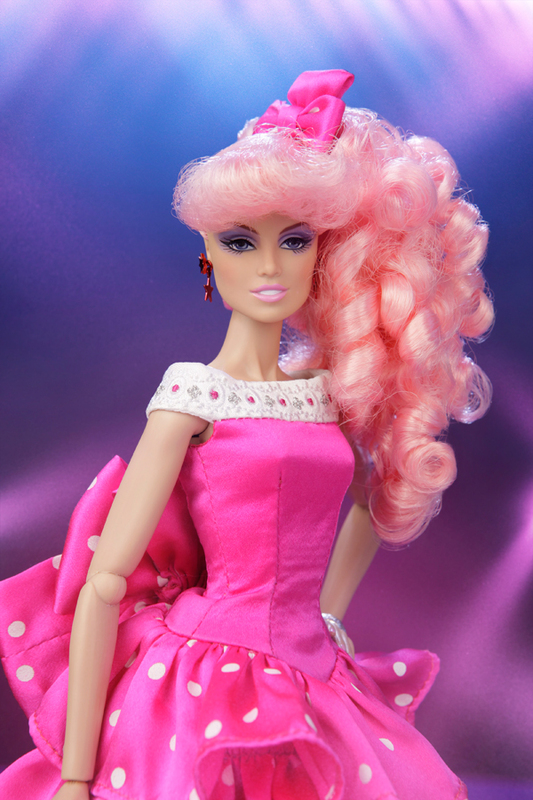 12 1/2", fully articulated fashion doll has extra long, pink and blond rooted hair! 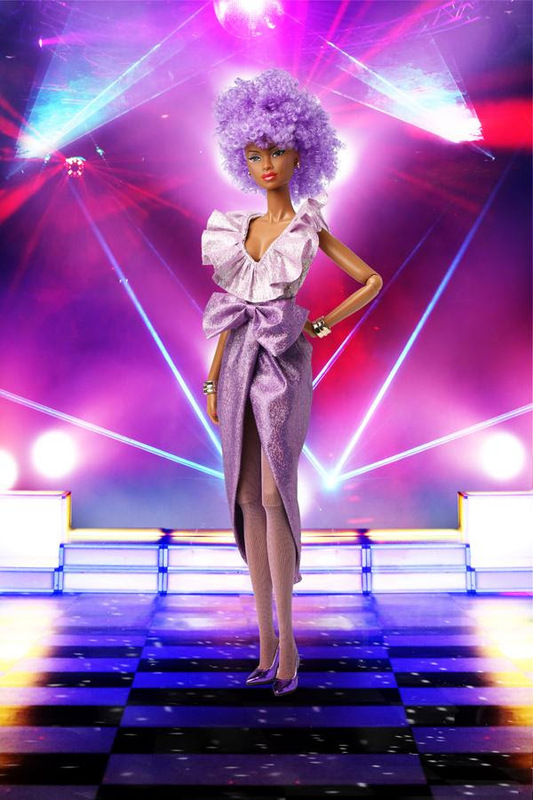 12 1/2", fully articulated fashion doll has purple and mylar streaked hair, lavender skin and an electrifying costume! 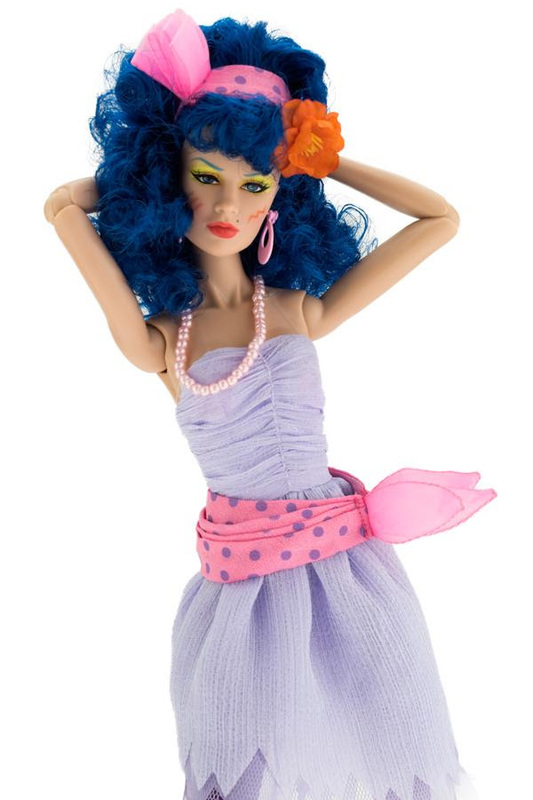 12 1/2", fully articulated fashion dolls have multi-colored hair and wild stage costumes! Jetta™ has pure black hair with silver mylar streaks and a black and white outfit! 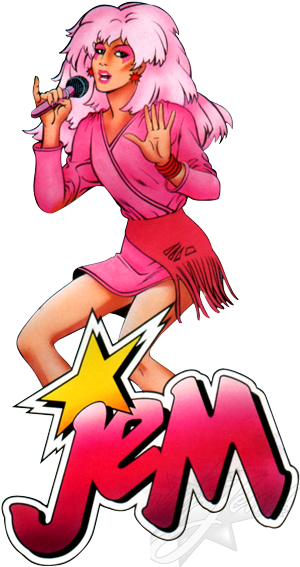 Ten high fashion outfits designed especially for JEM® and the Holograms!® Each outfit is multipiece with coordinating shoes and accessories! 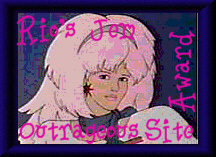 Ten high fashion outfits convert from Jerrica’s™ contemporary style to JEM’s® outrageous stage look! Designed in brightly-colored and shining fabrics, each outfit is multipiece with coordinating shoes and accessories! Rock around the clock wit JEM’s® Wrist Rocks! Three-function, digital watches in three outrageous, "JEM-themed" styles! Press the button or key to reveal the time! 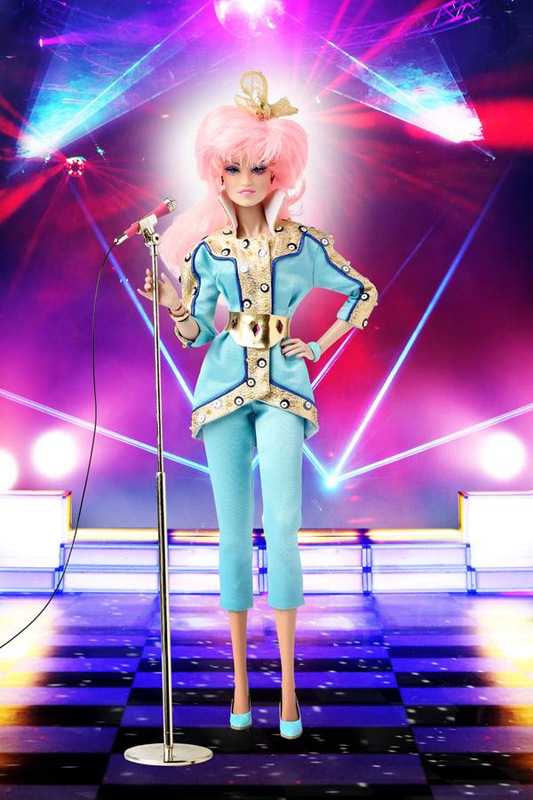 Six fabulous stage outfits for JEM® and the Holograms!® Each multipiece outfit includes a matching musical instrument and coordinating shoes! 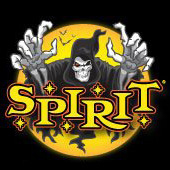 Eight wild stage fashions designed especially for the Misfits!® All in neon colors and exotic prints! Each outfit is multipiece with coordinating shoes and accessories! Fill the room with music and magic from JEM’s Rock Backstager! It’s a real audio speaker, a carrying case and a dressing room for a sizzling rock star! Mounted extension speaker with 36-inch patch cord hooks up to the JEM Star Stage™ tape player and the Glitter ‘N Gold Roadster™ FM radio! Use as a carrying case for all our JEM accessories! Girls can pretend to make outrageous videos with JEM® and her friends as the stars! Each playset includes over 10 stage props. 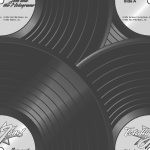 Use the backdrops and cassette tape with the JEM Star Stage™ to create electrifying stage performances too! "Welcome To the Jungle" contains clapboard, backdrop, cassette tape, flute, microphone, pretend video camera, hairclip, gloves, sheet music, two-sided mask, and sticker sheet! "It’s workin’ Out" contains clapboard, backdrop, cassette tape, horn, jump rope, barbell, director’s chair, headband, wristband, led warmers and sticker sheet! "Love is Doing It To Me" contains clapboard, backdrop, cassette tape, 2 stage lights, doll watch, keyboard, picture frame, microphone, necktie, gloves, face mask, eye mask and sticker sheet! "Show Me The Way" contains clapboard, backdrop, cassette tape, picture frame, pretend camera, tambourine, luggage, microphone, gloves, boa, glasses and sticker sheet! 4100 Star Stage™ with cassette player! 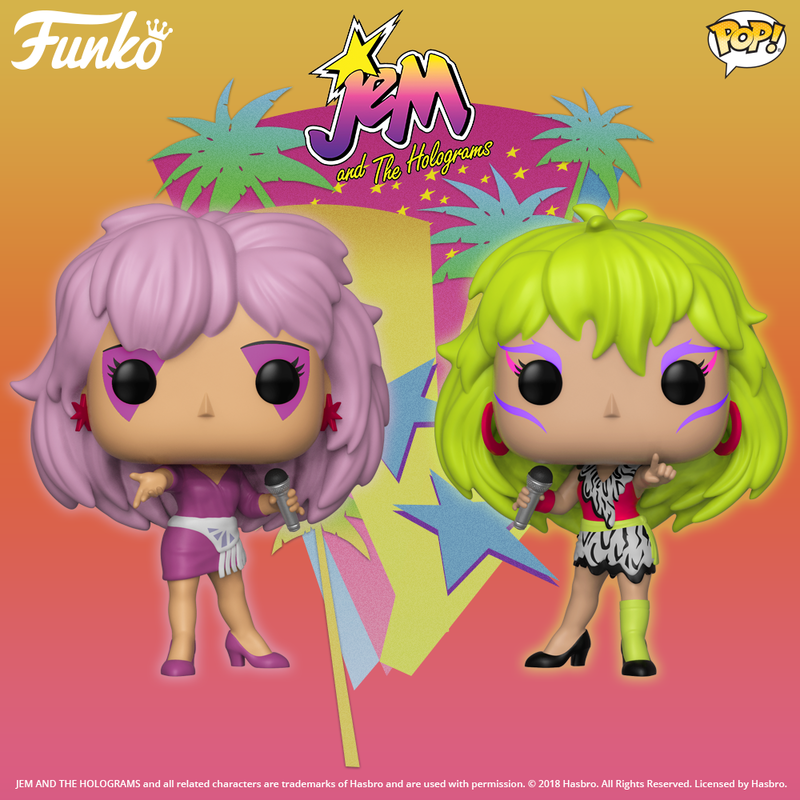 Presenting LIVE, on Stage…it’s JEM® and the Holograms!® The Star Stage transforms from a daytime office for Jerrica™ to a rockin’, reelin’ stage for JEM! Play the Holograms, Misfits® or other pre-recorded audio cassette tape on the built-in cassette player! Top panel lifts to become a stage back drop and provides access to all play pieces! Includes pretend spotlights and speakers, microphones, and "neon" lighting bolts! Second backdrop turns the Star Stage into an ultramodern office for Jerrica! Includes desk, hair, files, telephone and coffee cup! Close the Star Stage and it turns into a carrying case and "boom box" with shoulder strap! 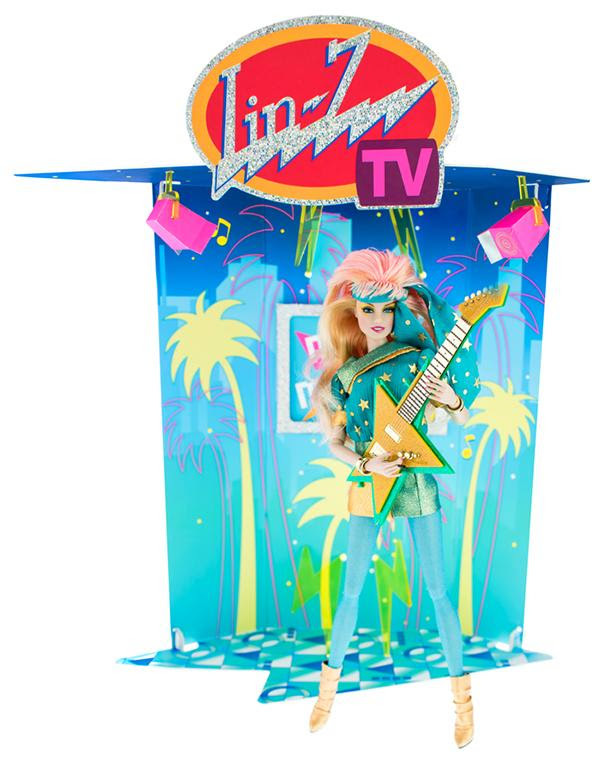 Use the Star Stage with JEM’s Video Madness™ Playsets and Rock Backstager™ extension speaker, too! JEM® has a dynamite New Wave Waterbed to relax on after her concerts! But when it’s time to jam with the Holograms®, the waterbed converts into a real electrionic, 17-note keyboard! Kids can play JEM songs on he keyboard with the help of a key-coded music sheet! It’s a real waterbed that can be filled with water! Transforms into a working, 17-note keyboard! 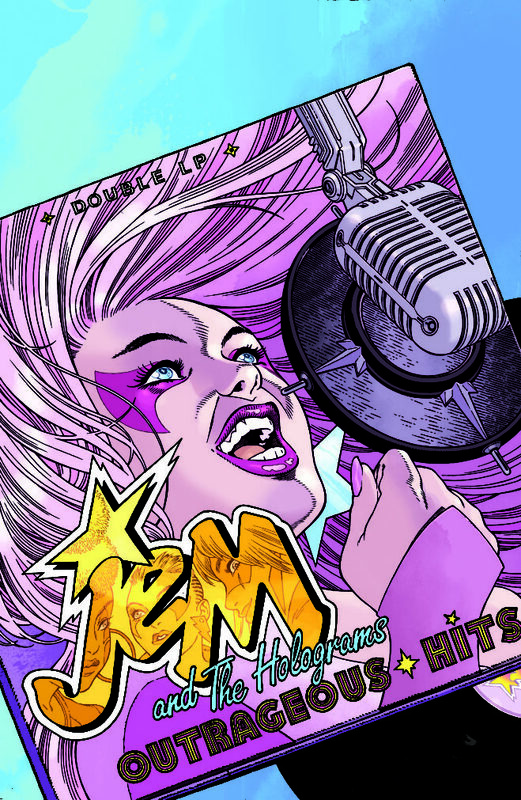 Special music sheet makes it easy for children to play JEM’s top hits! Store JEM’s clothes and accessories in the waterbed drawers! Drawers convert into speakers, table, 2-piece telephone and a "key-coded" music sheet! JEM’s® child-sized air guitar with working microphone, amplifier and speaker turns into KJEM...a rock ‘n roll radio station where JEM plays her hits songs over the radio waves! Kids can be the stars with their own working microphone and pretend air guitar! Air guitar converts to a pretend radio station where little girls and JEM can be -KJEM- disc jockeys! 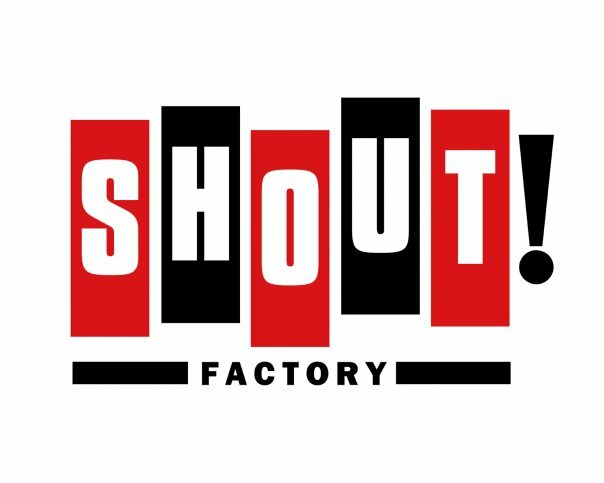 Includes air guitar with strap, working "child-size" microphone with jack, amplifier and speakers, console and control panel, chair, stool, music stand, telephone receiver, 4 microphones and stands, 6 hand-held microphones, 4 record player arms, 8 records with jackets, booth window and a music sheet! 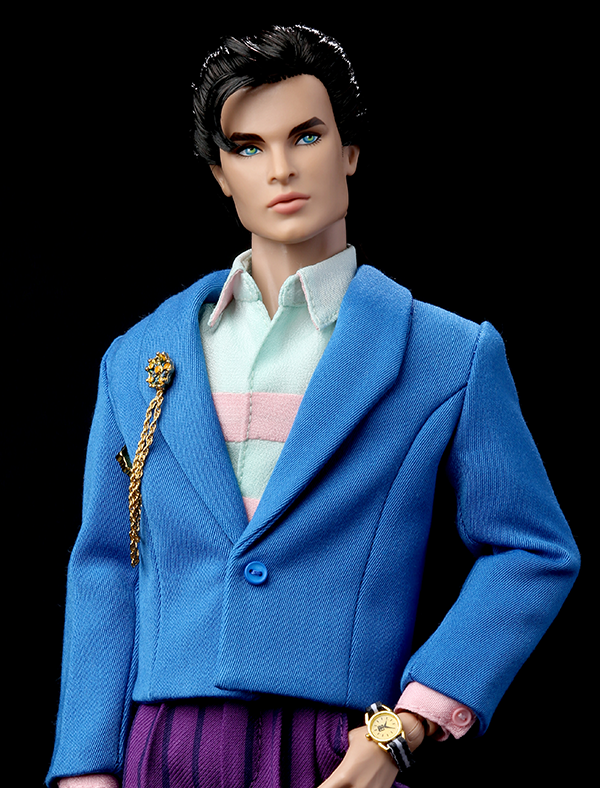 Jem is only briefly listed and not meeting Hasbro expectations.